Fumbles, interceptions, sacks, penalties, deep passes, breakaway runs – it's all here. 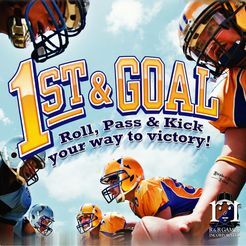 1st & Goal comes with three Running Dice, three Passing Dice, a Defense Die, a Play Die, a Referee Die, and a Penalty Die. The card decks include 60 Offense cards and 60 Defense cards.